Picture credit © Matt Mackey - Presseye.com Belfast - Northern Ireland -17th March 2016 Danske Bank Schools' Cup Final - RBAI v Campbell Collage, Kingspan Stadium, Belfast. RBAI captain Conor Field celebrates along with his team mates after winning the Danske Bank schools cup 2016. 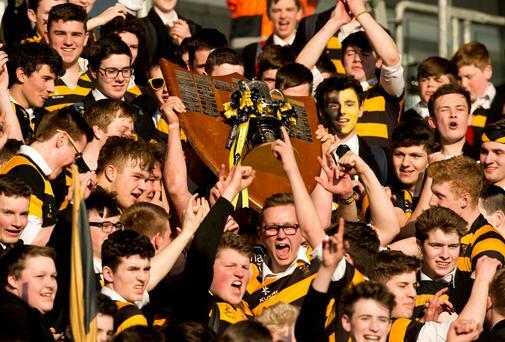 Picture credit © Matt Mackey - Presseye.com Belfast - Northern Ireland -17th March 2016 Danske Bank Schools' Cup Final - RBAI v Campbell Collage, Kingspan Stadium, Belfast. RBAI captain Conor Field celebrates Danske Bank CEO Kevin Kingston and his wife Deborah after winning the Danske Bank schools cup 2016. Picture credit © Matt Mackey - Presseye.com Belfast - Northern Ireland -17th March 2016 Danske Bank Schools' Cup Final - RBAI v Campbell Collage, Kingspan Stadium, Belfast. RBAI captain Conor Field celebrates Danske Bank CEO Kevin Kingston after winning the Danske Bank schools cup 2016.